whether expressing just how hot or cold it is, how erratic our weather system can be each year, or if it’s that go-to topic for taxi conversations; everyone has an opinion. Recent developments at the BBC have only spurred this on as they announced that as of 2016, they will not be using the Met Office for their forecasting. This long-standing partnership has been going strong since the BBC’s first broadcast back in 1922. 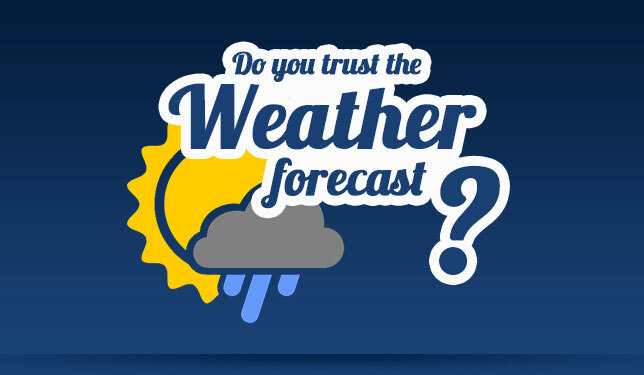 Looking at the results of the survey, we found that almost 60% of respondents trust the forecast provided by the Met office either a lot – telling us that they think it’s usually right (52.9%), or completely – telling us they think it’s always right (6.6%). With over half of the population still trusting the Met Office’s forecasting, the planned move away from the BBC obviously hasn’t harmed their reputation for accuracy and reliability. 52.9% of people trust this service for the most part, answering; ‘Quite a lot, it’s usually right’. Acknowledging that sometimes the weather is impossible to correctly predict 100% of the time (especially in this country). However, 29.3% of the respondents answered; ‘Not much, it’s rarely right’. Whilst this number is relatively low compared to the previous, it is still significant. This increased level of distrust could be fuelled by such news meaning a potential impact on the Met Office. Other options within the survey were; ‘Not at all, it’s impossible to predict’ (11.1%) and ‘Completely, it’s always right’ (6.6%). It could be argued that these more extreme results could also be due to age as those aged 25-34 answered ‘Not at all’ as their most prominent response. This could be due to age related factors such as likelihood of having access to a range of weather technologies including apps that update every hour. However the youngest of the respondents (aged 18-24) voted ‘Completely’ as their most prominent answer, suggesting their may be more than just the trust of the Met Office affecting this survey but potentially general opinion of weather forecasting regardless of the provider. From this we can state that the general population understand that weather forecasting is a complicated science that isn’t always right but is still checked and trusted on the whole and that the Met Office is obviously a provider that, for the most part, meet this need. 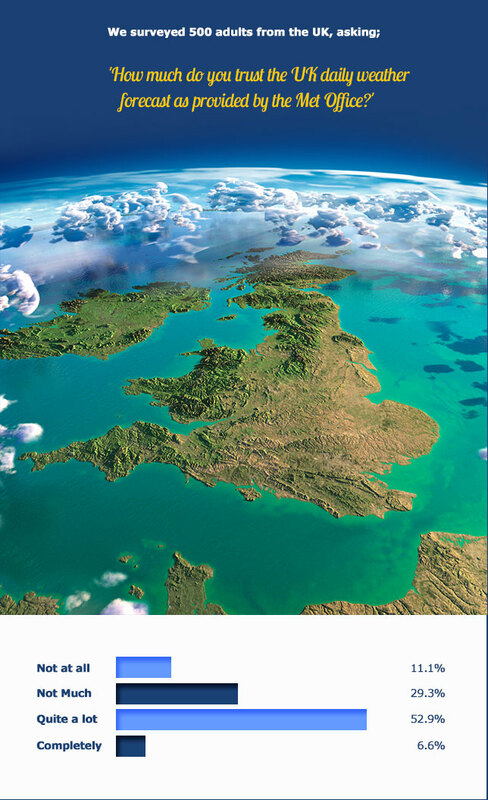 We have no doubt that the weather will always be a cause for concern for the Great British public.